Wesleyan has an open curriculum with no required courses in any field an only a broad set of General Education Expectations. In addition to 45 majors and 17 minors in 38 different departments, Wesleyan offers 12 certificate programs in areas such as Civic Engagement, Environmental Studies, Informatics and Marketing, International Relations, and many more. The student-to-faculty ratio is 8:1 and the average class size is less than 20 students. The faculty's committment to resarch and scholarship creates unparalleled opportunities for undergraduates to participate in faculty research, and does not come at the expense of teaching (faculty teaches every class at Wesleyan). Seniors are encouraged to highlight their work in a capstone project. The Wesleyan McNair Program assists students from underrepresented groups with preparing for, entering, and progressing successfully through post-graduate education. The Mellon Mays Undergraduate Fellowship Program seeks to increase the number of minority students, and others with a demonstrated committment to eradicating racial disparities, who will pursue PhDs in core fields in the arts and sciences, and aims to reduce over time underrepresentation of minority groups on faculties. The Allbritton Center for the Study of Public Life brings together students, faculty, staff, alumni, and community partners through support of cutting-edge scholarship, high-impact teaching practices, rigorous debate, and broad dissemination of work pertaining to public life. The Jewett Center for Community Partnerships (JCCP) is the home of community engagement at Wesleyan University. Guided by the principles of mutual respect and collective responsibility, the JCCP focuses on developing and maintaining local partnerships with schools, nonprofit organizations, government agencies and the community at large through the Office of Community Partnerships, the Center for Prison Education, and WESU-FM 88.1 (all the way left on your radio dial). Wesleyan's diverse selection of distinctive programs inspire students to think both critically and creatively. Opportunities like The Shapiro Creative Writing Center, The Quantitative Analysis Center, The Center for the Humanities and the Fries Center for Global Studies are just a few of the unique, interdisciplinary approaches to learning students immerse themselves in. The Patricelli Center for Social Entrepreneurship supports students and alumni interested in creating and sustaining programs, businesses, and organizations that advance the public good. 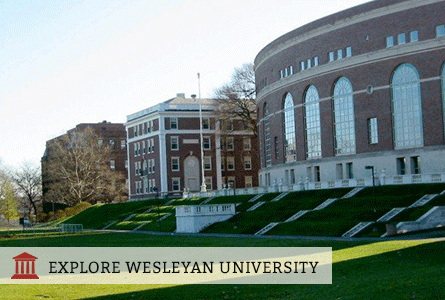 Wesleyan participates in Dual Degree Programs in engineering which give students both a B.A. from Wesleyan and a B.S. in engineering from Columbia, Dartmouth, and Caltech. Take advantage of the BA/MA program in the natural sciences, mathematics and psychology where you can earn a BA and MA in five years. Tuition for the 5th year is waived.